The Photo’s Caption Says It All! 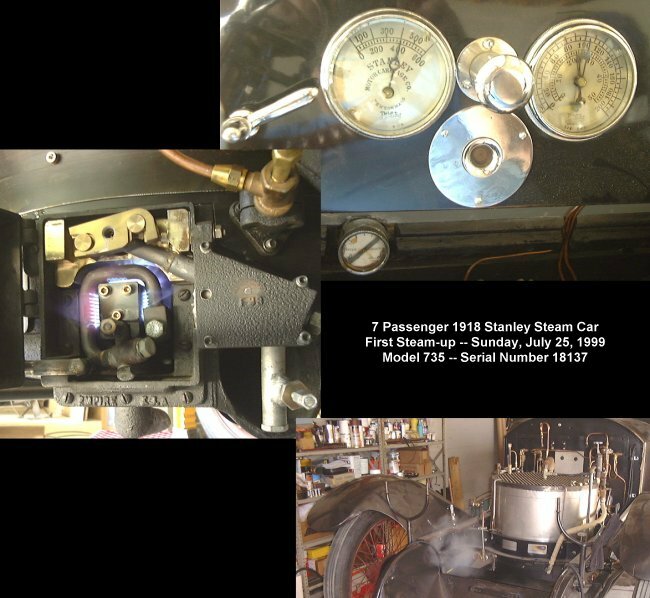 It took one year to the day from the time that the boiler that came with the car had failed its hydrostatic test until the replacement boiler was generating steam and steam had returned to the steam engine. The last time the car had been under steam was June 1992. The upper right photo shows the dash board gauges. 400 PSIG steam pressure is present on the boiler as indicated on the left gauge. The burner’s kerosene fuel pressure is slightly about 100 PSIG while the pilot fuel tank’s pressure is slightly over 20 PSIG. To the left center is the pilot which burns continuously while the car is in operation. The pilot maintains steam pressure while the car is at rest, it keeps the vaporization tubes hot, and it is the ignition source for the burner when steam pressure needs to be increased. At the lower right is the new boiler with wisps of steam emanating from the feed water heater to the left of the boiler. With this test now complete, the condenser would be installed and the steam from the feed water heated would be cooled and condensed back to water for reuse in the boiler.